When it comes to serving a large of group of people, my preference is to prepare individual sized mini cakes. Mainly it is easier to ensure everyone gets a piece as well as avoiding the baked goods looking like a crime scene half way through self-serving ha! Having said that, you can’t deny the “wow” factor that comes with a larger cake. Usually, I will bake a whole cake (rather than mini cakes) for an intimate dinner party. 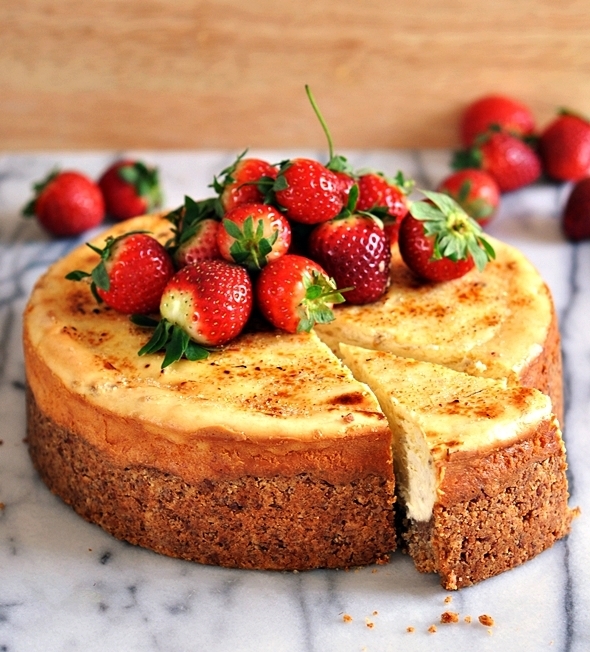 As Valentine’s Day is only a couple of days away, I thought now would be a great opportunity for me to share the larger version of my gluten free banana cheesecake with almost a punnet worth’s of strawberries! Valentine’s Day is the day with lots of red, hearts and kisses. Or at least I think how it should be like in my head ha! While I don’t need a reason to eat plenty of fruits, I feel it is a day where I can really go crazy with strawberries or for this instance, on my glorious almond meal crusted banana cheesecake with no judgement. Preheat oven to 180C for convection oven or 160C for fan force oven. Line the bottom of a 20cm spring form pan with baking paper and grease the side of the pan with melted butter. Set aside. Add almond meal, butter and brown sugar. Mix until well combined. 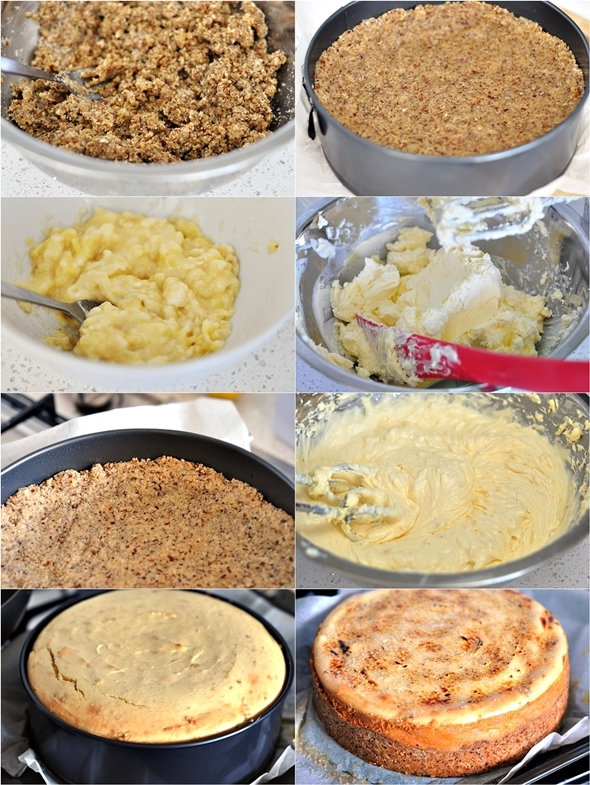 Press the almond meal crumbs over base and the side of the prepared pan. Bake in the preheated oven for 10 minutes or until lightly golden brown. Set aside to cool. Preheat oven to 160C for convection oven or 140C for fan force oven. Mash banana with lemon juice and set aside. In a large mixing bowl, cream Philadelphia Cream Cheese and caster sugar with a handheld/stand mixer until light and fluffy. Add eggs, one at a time, and beat until well combine. Stir in the mashed banana into the batter until well mixed. Transfer the cream cheese batter onto the cooled almond meal crust. Place the spring form pan on a flat cookie pan to avoid leakage. Bake the cheesecake on the bottom rack (this is to prevent the surface from cracking) for an hour, or until the surface of the cheesecake appears to be light golden brown. Transfer the cheesecake onto a plate to cool completely. Refrigerate the cheesecakes for at least 3 hours, until it is fully set. Sprinkle sugar on the cheesecake and caramelised the sugar with a blow torch. Finish off with strawberries for decoration and serve immediately. You will a spring form pan, cookie pan, handheld/stand mixer & blow torch. If you're interest, you can check out here for the mini cheesecake recipe. Happy Valentine’s Day, my friends! Regardless of how you’re going to spend that very day, just remember that we should count our blessing for having someone we love and care for. 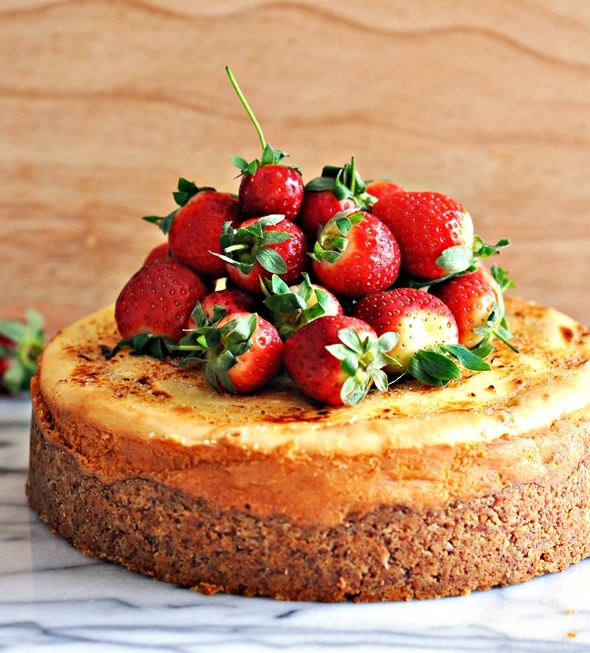 What a beautiful cheesecake! I have yet to try a banana one and this might be just the needed “push” towards making one. I’ve got cheese, I’ve got biscuits and bought bananas today, i guess it’s time. Thanks for inspiration! What a lovely cheesecake! It looks so incredibly delicious and I bet tasted even better! I really love the sound of the almond meal crust. It would have so much more flavour than the usual dull biscuit variety.